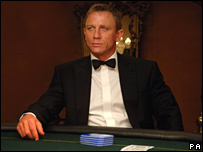 The tuxedo worn by Daniel Craig in the James Bond film Casino Royale has raised £12,000 for the children's charity ChildLine. Proceeds from the auction will go towards ChildLine's 20th birthday goal of £20m, which will help the charity answer at least 1000 more calls a day. A walk on part in Desperate Housewives sold for £17,000 and the Big Brother chair went for £5,500. An estimated £150,000 was raised through the online auction. It concluded with a 1920s-style ball at London's Park Lane Hotel on Sunday. The charity's founder and president, TV presenter Esther Rantzen, said bidders had helped ChildLine in its aim of doubling the number of volunteer counsellors. Rantzen also said the support and money raised had "surpassed my wildest dreams."